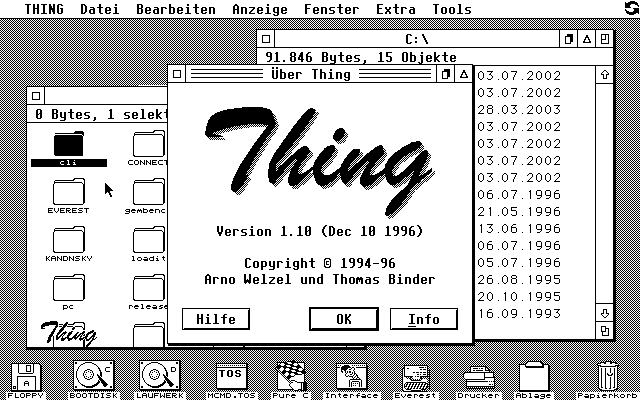 Thing is an alternative desktop for Atari TOS and compatible systems (MagiC, MiNT, MultiTOS) and was developed by me between 1994 and 1996 entwickelt. During 1996 Thomas Binder took over the development. At the beginning of the 1990s the Atari ST and TT were still widely used in Germany. Due to the standard MIDI interface, these devices have long been the de facto standard for musicians with programs such as Steinberg Cubase or MIDAS. 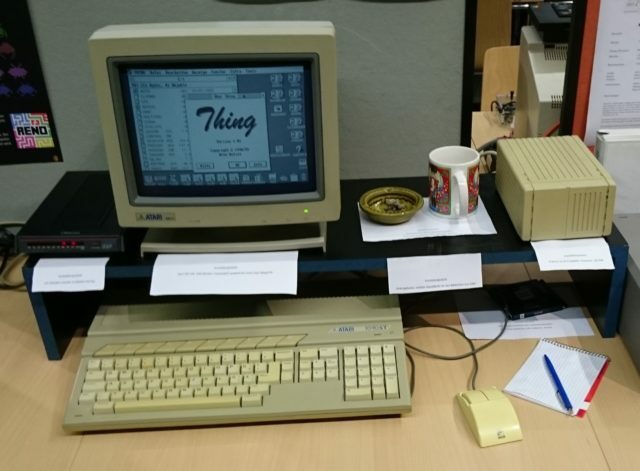 With a laser printer (Atari SLM804) that was quite affordable at the time and software like Calamus and Papyrus, the Atari TT with integrated hard disk has established itself as a cheap alternative to the Mac for DTP. The operating system provided by Atari – TOS – was a mixture of a DOS-like subsystem (GEMDOS) and a graphical user interface based on GEM by Digital Research. The first version was developed under great time pressure and was released already in 1985. Since the software had to deal with limited memory, the desktop was very simple: there were only icons for the currently available drives and a rudimentary file manager. This has not changed significantly in later TOS versions. Alternate desktops were developed by others, of which “Gemini” was one of the best known and was published in 1989. With the version 1.999 of Gemini, published in the year 1993, it became clear that development of Gemini will not go on. At the same time there were also alternatives for TOS such as MiNT or Mag! X, which later was renamed to “MagiC” for legal reasons. Gemini, however, lacked the support of some of the functions of these new systems, e.g. the correct handling of long filenames or support for “real” (preemptive) multitasking. So I decided to develop my own alternative with “Thing” in 1994, initially only for myself. As development environment, I used a TOS version of Borland Turbo C, which later was released and updated as “Pure C” by Application Systems Heidelberg. The name “Thing” derives from a pub in Augsburg, where I lived and which still exists today. After a few months, Thing finally made it to the point where I released a first version on MausNet. The focus of the further development was to support as many as possible of the existing extensions provided by TOS alternatives, such as long filenames and preemptive multitasking, customizable fonts in windows and use of proportional fonts for text output and support of hardware with any resolution and color depth. So Thing also runs smoothly in an environment with 1024×768 pixels and 16 colors. In addition, however, I also made sure to support some aspects of Gemini, especially the “AV protocol” (“Application-Venus protocol”, since Gemini named the desktop “Venus”). Applications can communicate with the desktop and each other with the help of the desktop. This protocol was also extended by additional functions. In addition, there were non-modal dialog boxes and a comprehensive documentation in the form of an integrated help function using the hypertext system “ST-Guide”. In 1996 I already worked professionally with PCs and could not take care of Thing any more. Therefore I handed over the project to Thomas Binder who had already contributed the console integration TOS2GEM and code in Thing for colored icons. Atari already struggled since 1992 and the hardware business was finally discontinued in 1996. Many years later the “Atari Coldfire Project”, now under the name “FireBee”, was created to provide modern hardware for the existing Atari software (see also http://firebee.org). By the way: the ash tray is just an exhibit, since I was still smoker in the 1990ies and I wanted to show the scene as authentical as possible. Nowadays I’m a happy non smoker.